Work Sharp has partnered with legendary hall of fame knife maker Ken Onion to develop a new knife and tool sharpening platform with expanded features! The combination of Work Sharp engineering and Ken Onion's industrial design has created a fast, easy and stylish way to sharpen all your knives and tools with precision and repeatability. The Work Sharp Knife & Tool Sharpener Ken Onion Edition is designed to sharpen every knife you own. Using a fully adjustable precision sharpening guide, variable speed and wide flexible abrasive belts it sharpens pocket & hunting knives, serrated knives, kitchen knives and any other shape or type of blade you own. Professional blade makers like Ken Onion use flexible belts to put a razor sharp edge on their blades, now you can have the same technology in your home or shop. Work Sharp Engineered and Ken Onion Designed to deliver the pinnacle of knife sharpening. The 3/4" x 12" premium, flexible engineered abrasive belts* sharpen virtually any shape or type of knife blade and uses a precision sharpening guide to ensure that you get a consistent angle every time. The sharpening guide is fully adjustable from 15° to 30° so you can sharpen any knife to the angle you desire to best meet your needs. The variable speed control (1200 SFM to 2800 SFM) provides you with the optimal belt speed for the task at hand. The Work Sharp Blade Grinding Attachment is designed for knife shaping, sharpening and honing tasks. It is constructed using cast metal components and engineered polymers built to endure the rigors of heavy shaping and sharpening tasks. The unit quickly connects to the Ken Onion Edition Knife & Tool Sharpener without tools, and belts are easily changed by hand. The blade grinder uses 1”x18” engineered abrasive belts in a wide range of grits, and a 4 pulley system that is fully adjustable from 10° to 35° in 1° increments. Belt speed is adjustable from 1200-2800 SFM (square feet per minute) to accommodate a wide range of sharpening and honing tasks. The center position of the top two pulleys is adjustable to set your preferred belt deflection – a full convex or a near flat convex – allowing you to customize your cutting edge to best meet your needs and preferences. The Work Sharp Blade Grinding Attachment is similar in design to the systems professional blade makers use, providing knife enthusiasts with a high-quality, precise machine to shape, sharpen and hone your blades without the cost of full scale blade maker’s equipment. The Work Sharp Guided Field Sharpener is a complete sharpening solution for field, home or shop use. 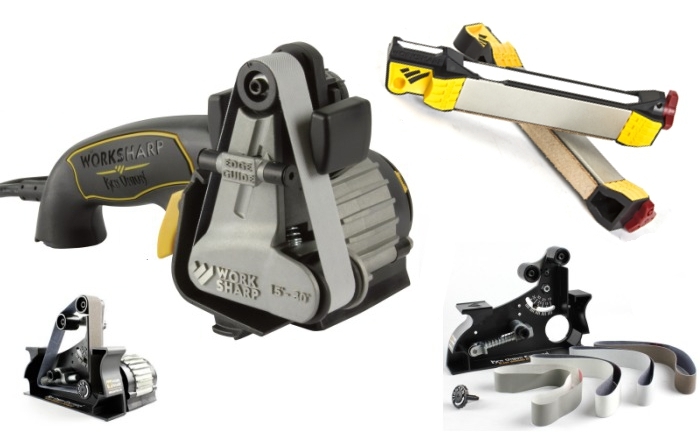 It is the first angle guided, 5 stage sharpening solution designed for sportsmen who need a complete, robust and compact field sharpening solution. Darex brands include Darex industrial bit sharpeners, Drill Doctor® professional and DIY drill bit sharpeners, and Work Sharp® knife and tool sharpeners. Darex began in 1973 in Beecher, Illinois. The D, A and R of DAREX are the initials of three generations of the Bernard family; David, Arthur and Richard Bernard. David and his father Richard founded Darex. Grandfather Arthur Bernard, who earlier founded the Bernard Welding Company, contributed his energy and guidance to Darex. In 1978, Darex relocated to Ashland, Oregon where they are located today. In 2008, Matthew Bernard became the fourth generation family owner of the company. Since its beginning, Darex has grown to become the makers of the world’s best-selling industrial drill sharpeners as well as full range of commercial and consumer sharpening products. Darex has been helping industry professionals and do-it-yourselfers stay sharp for over 40 years. Prize winners must be U.S. residents at least 18 years of age who have made one or more qualifying contribution of at least $20 each to Knife Rights, Inc. (“KR”) during the eligibility period or who have submitted an entry in accordance with the published rules. Winners of firearms, suppressors or knives must not be prohibited from owning or possessing them under applicable laws. Offer void where prohibited. No more than two (2) prizes will be awarded to any one person in each of the Early Bird Bonus Drawing and Main Drawing. No more than one (1) prize will be awarded to any one person in the Tail End Drawing, if held. A Tail End Drawing is not guaranteed to be held. You can donate as often as you like, but each donation is separate and independent from previous donations and will only entitle you to the number of entries specified at the donation level you have selected at the time of each donation. Each donation must include full name, donation amount, shipping address and phone number to be valid. Winners need not be physically present at the drawing to win. Firearms and suppressors will not be shipped directly to winners, but rather to Federal Firearms Licensees (“FFLs”) specified by winners (or selected by KR or Hill Country Class 3 LLC d.b.a. Silencer Shop (Silencer Shop), in KR’s and Silencer Shop’s sole discretion). Winners can only take possession of firearms and suppressors from the FFLs. Optional suppressor included with some firearms prizes can be excluded if the winner is ineligible for any reason or prefers not to become subject to the requirements of the National Firearms Act (NFA). Current wait times for NFA transfers conducted by the BATFE are nine to twelve months and could be longer. KR is not responsible for tracking such wait times. Winner is responsible for compliance with the NFA and all state and local laws governing the possession of NFA items in the winner’s jurisdiction. Neither KR, nor KR Affiliates (as defined below), nor their successors or assigns, nor the supplier of the suppressor prize, are responsible for failure to complete delivery of such prize for any reason, including without limitation the prize winner’s failure to comply with any legal requirements. Declining to accept a suppressor prize, or failure to satisfy the legal requirements for a firearms or suppressor prize selected, forfeits any claim to that firearm or suppressor prize and no replacement, alternative prize, or cash equivalent will be provided. Automatic knives will not be shipped directly to winners unless a legal recipient under 15 U.S.C. §§ 1241-1245 and 18 U.S.C. § 1716(g), but rather to an authorized dealer in eligible winner’s state from which winner can claim prize. Some prizes are subject to additional limitation(s) that is/are included in prize description and by selection of such a prize the winner automatically accepts and is bound by the stated limitation(s) and rules regarding selection and delivery as if the limitation(s) was/were included herein. Claim to prizes is not transferable with the exception that delivery of a suppressor prize can be received by a trust of which the winner is a responsible person qualified to receive an NFA item. The odds of winning vary based on the number of donations and amounts donated. Winners will be drawn on or after August 1, 2019, for the Main Drawing. Early Bird winners will be drawn on or after May 30, 2019. If held, Tail End Drawing winners will be drawn on or after August 1, 2019, immediately prior to the Main Drawing. A minimum of the first 75 winners drawn in both the Early Bird and Main Drawings, and the first 5 winners in the Tail End Drawing, if held, will have first choice of prizes available after any prior winner(s) have selected, in the order in which such winners were drawn (“Winner’s Choice”). At KR’s option, additional Winner’s Choice prizes may be awarded. Accordingly, the final posting of winners may take up to 180 days post drawing. Winners must comply with all applicable legal requirements prior to taking possession of firearms, suppressors or knives. Winners are solely responsible for determination of legality. If for any reason winners cannot comply, prizes will be held for 30 days and then will be forfeited and returned to KR. Winners of firearms are responsible for shipping charges, transfer fees to FFLs and any other applicable fees and may be required to prepay such expenses by valid credit card or other method to be determined in KR’s sole discretion. NFA prizes will be transferred via the “Powered By Silencer Shop” dealer network. Winner will not incur any additional charges unless exceptions are made. Exceptions include but are not limited to: changing SOT dealers after paperwork is filed, changing registration type, facilitating a dealer outside of the “Powered By Silencer Shop” dealer network. In most cases, Silencer Shop will handle the transfer from start to user receipt and will require contact with the winner to insure registration information is valid and complete. If communication cannot be facilitated between Silencer Shop and the winner, NFA Prizes will be held for 30 days before return transfer to the manufacturer is initiated. All prizes other than firearms will be shipped at KR’s expense via a shipping method of KR’s choice, signature required at KR’s option, to the addresses provided by winners, insured. If winner declines KR’s signature required delivery, they accept all risk for non-delivery regardless of cause. If delivery is not completed on original shipment, regardless of fault, winner is responsible for any redelivery charges. Winners are hereby warned not to sign for delivery without the package in hand and undamaged. Winners who do not respond to a delivery notice, regardless of reason, are responsible for any redelivery charges. Winners of prizes after the Winner’s Choice prizes are selected will be sent their prizes without prior notification to the address provided. It is donor’s responsibility to notify KR of any change in address. KR is not responsible for lost, damaged, stolen or undelivered prizes, regardless of cause, and winners agree to look solely to insurance carried by KR or included by shipper with regard to same. KR is not responsible for reimbursement of any insurance deductible, which may be in an amount of up to $500. Risk of loss or damage is solely with winners. KR will attempt to notify all Winner’s Choice winners using the contact information supplied. It is donor’s responsibility to notify KR of any change in contact information. Any prize not claimed by a Winner’s Choice winner within 48 hours from KR’s first attempt to notify the winner will be forfeited and all other winners drawn will move up one place in priority. If a Winner’s Choice winner that does not respond within the 48 hours later contacts KR, they will be offered the choice of prizes then currently available if within the Winner’s Choice draws, if any, after the current notified winner selects a prize. Otherwise, prize will be forfeit. All entries and donations are non-refundable and will become the sole property of KR once submitted. Acceptance of a prize constitutes winners’ permission for KR to use winner’s name and likeness for KR promotional purposes without additional consideration. If payment of any donation is rejected, denied, returned for insufficient funds, refunded for any reason or otherwise not made, and the responsible party does not subsequently make full payment plus processing fees of $25.00 that clears no later than 7 (seven) days prior to drawing, the entries related to that donation will be removed from the drawing. Winners of “Early Bird” prizes are eligible for (and their winning entry will be automatically entered in) the Main Drawing. If held, winners of “Tail End” prizes are eligible for (and their winning entry will be automatically entered in) the Main Drawing. Once an individual winner has been selected as a prize winner in the Main Drawing, that winning entry is removed. There is no cash substitution for any prizes. Winners Choice winners will be notified using the contact information supplied and informed how to claim prizes. Only those named as the entrant on a valid winning entry form are eligible to claim a prize, and such persons may be required to provide proof of identification acceptable to KR in KR’s sole discretion. KR shall not be liable for failure of notification arising from incorrect or illegible contact information supplied, or email or voice mail induced failures, or failure of entrants to respond to communications (or failure of KR to actually receive such responses regardless of cause) within 48 hours of KR’s first attempt to notify the winners. KR’s obligation is limited to making good faith efforts to notify winners. Once all winners are drawn and notified, names of winners (given name and surname initial.) will be posted at the Knife Rights Ultimate Steel web site: www.KnifeRights.org/UltimateSteel. All prize winners are subject to applicable drawing procedures, restrictions, rules, directives, applicable laws and regulations, and are solely responsible for all applicable taxes, fees, assessments and charges relating to the prizes. Your participation in this fundraiser (including without limitation the act of submitting a donation and/or winning a prize) signifies and is conditioned upon your acknowledgement, agreement, covenant, representation and warranty to KR, based on good and valuable consideration, receipt of which you acknowledge, that (i) KR, its officers, directors, affiliates, professionals, personnel, representatives and members, together with Silencer Shop and its officers, directors, affiliates, professionals, personnel and representatives together with prize donors (collectively, “KR Affiliates”) shall have no liability whatsoever in connection with this fundraiser, the prizes (or their acceptance, possession, use, or misuse), or anything arising out of or relating thereto; (ii) you waive and release any and all claims you may now or ever have against KR Affiliates; and (iii) you will not make any claims against KR affiliates and shall be estopped from so doing. KR makes no claim regarding the actual value of any prize and is not responsible for the accuracy of any value estimate provided by prize donors or anyone else. Manufacturer’s Suggested Retail Price are listed for production items which may be purchasable for a lower price. KR does not guarantee the accuracy of the prize descriptions published. Prizes are in as-is condition. KR makes no warranty as to merchantability, fitness for a particular purpose, suitability or condition of the prizes. Prizes donated by individuals may have been previously used. Firearms prize package accessories may have been mounted for display and then dismounted from the firearm. Notice is hereby given that prizes incorporating Mammoth, Mastodon, or Fossil Walrus ivory, tooth or tusk (and/or other materials that may become prohibited or regulated) are prohibited by state law from being claimed by residents of some states, including but not limited to New York, New Jersey, California, Oregon and Hawaii. Prizes subject to change without notice. Production prizes may be substituted with prizes of equal or greater value prior to prize selection. Some prizes were not received by KR prior to the start of the fundraiser and KR is not responsible for the failure of any prize donor to fulfill the obligation to deliver the prize by the drawing date. A donation is not required to be entered in the drawing. To enter without making a financial donation, send a postcard with your name, phone number, email and shipping address to: Knife Rights 2019 Ultimate Steel, PO Box 657, Gilbert, AZ 85299. Your postcard must be received no later than July 31, 2019 to be considered a valid entry. Only one postcard per person is allowed. KR is not responsible for undelivered or illegible postcards. Knife Rights, Inc. is a 501(c)(4) exempt organization. Donations to Knife Rights, Inc. are not tax deductible charitable contributions. Check with your tax professional for additional information.